With more than 10 years experiences of organizing biking trip in China, we are happy to introduce you the good chance to see, hear, touch, taste, and feel the unseen but fabulious side of China. The itinerary is practised by Hongkong International School annually and hundreds of western cyclists. You will explore the Southern China where you will enjoy easy transportation because the area is close to Hongkong but so diferent! Ferry into China and meet the China guide at Kaiping ferry terminal at 1:00pm. Lunch at terminal then bus to Jicheng, Xingxing city. Check in the Foreign Merchants Hotel. Bike north west around Chuanggang / Jicheng area towards Xingxing, visit a city school, then back to the hotel. Biking distance on will and subject to time. Bike to Dunfen, Dinggong then to reservoir. Visit a weaving factory en route. 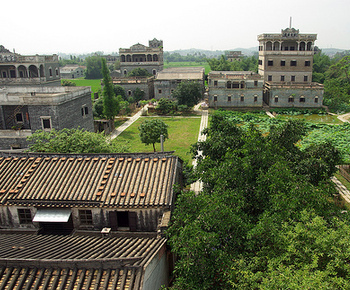 Mount bikes and ride north of river to Chikanzhen. Visit 5 Martyrs and the No.1 Middle School. Clean up bike and load onto the lorry.